Located just off the Strand on John Adam Street, RSA House is a centrally located Georgian building steeped in history, home to the Royal Society for the encouragement of Arts, Manufactures and Commerce – a famous centre for enlightened thinking since 1754. Whether it is a conference for up to 180, location filming, a new product launch or a wedding ceremony, reception or party, we provide the very best in hospitality. A glass-domed ceiling lights up the Great Room, home to the epic paintings ‘Progress of Human Knowledge and Culture’ by James Barry, commissioned especially for the room. The underground 18th century exposed brickwork Vaults, historically housing cattle and wine, provide an unparalleled backdrop for events. The Tavern room, which started its existence as the tavern at the original Adelphi Hotel provides a light and airy space for many types of events, looking out onto John Adam Street. It even features in Charles Dickens' Pickwick Papers, and Dickens himself was a member of the Society, serving as a Vice-President and on two of its committees. 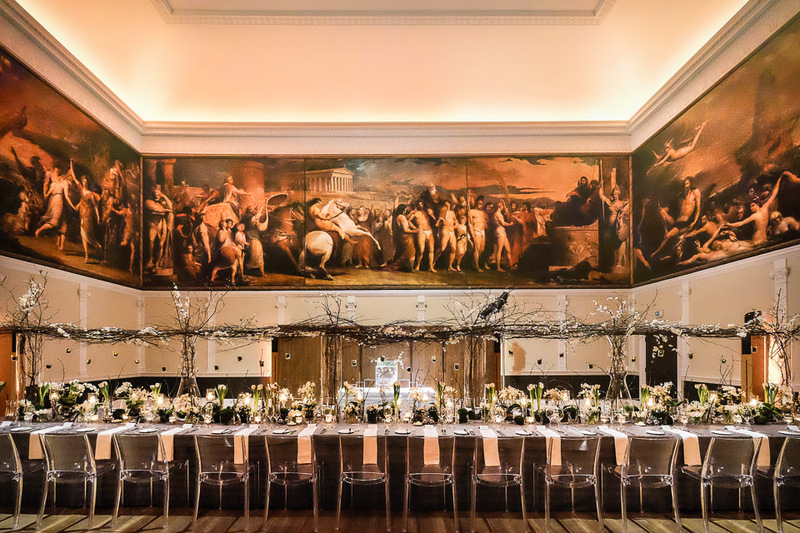 A working theatre, built on the last remaining stretch of 18th century cobbled roadway, originally used to transport goods from the Thames to the Strand and seven further meeting rooms all make RSA House an event space like no other. Situated above the Vaults, Rawthmells offers all day dining (8:30am – 8:30pm), and seating across a variety of spaces. The space will also give access to superb thought provoking content delivered by the RSA events team. Designed to get the conversation started, Rawthmells makes a fantastic new option for socialising pre-or-post event, as well as being an inspiring co-working space. Creating the enlightenment coffeehouse has involved a significant amount of work including the transformation of two entire floors of the House over a 9 month period, and opening up hidden parts of the building for the very first time. Rawthmells is a natural home for anyone who wants to change the world, enabling people to connect, share knowledge, collaborate, and drink good coffee.